The Bergamo Collection celebrates three famous climbs in the town of Bergamo, where Santini are based. Each piece of the cycling kit has a unique design with details that are inspired by the scenery on each climb. Known for its stunning scenery, Forcella di Berbenno is situated in the Alps with a 343m climb over an 8km cycling route. 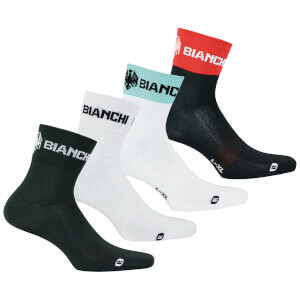 Light and breathable, the cycling socks complete the race specific cycling kit. Designed with signature Berbenno graphics on the cuffs, the socks are hard-wearing and durable to keep your feet comfortable on long rides. Brought these socks on sale, the price is great. Colour and fit are perfect, although they are a bit on the short side. Unfortunately after only a few long rides they developed small holes in the end near the toes. Which are now getting bigger. I’ve had many pairs of socks from other brands and I haven’t had this issue before. I make sure my toenails are short so not to cut the fabric. That’s why I’m giving them 3 stars.